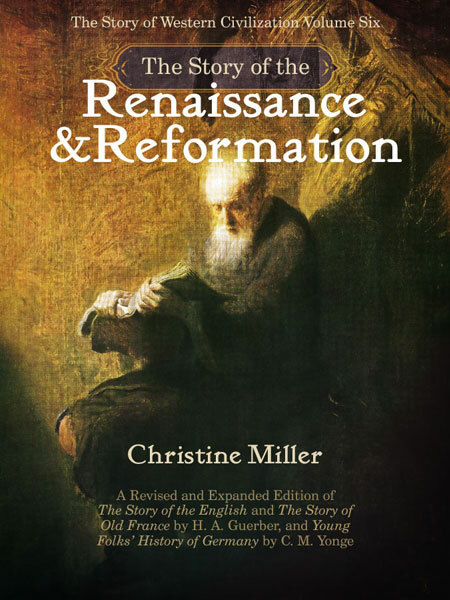 he Story of the Renaissance and Reformation is a soft-bound 8-1/2×11 inch book of 298 pages. There are 99 chapters, with each chapter consisting of two to three pages of text. The cover art is The Philosopher Reading by Rembrandt Von Rijn, in the Metropolitan Museum of Art, New York City. The Story of the Renaissance and Reformation opens by very briefly reviewing the era of medieval Europe, settling in with the history of the Italian city states in the 12th and 13th centuries, and proceeding past there to the events of 14th and 15th centuries, what we think of as Renaissance and Reformation history proper. It ends with the restoration of the king to the throne in England in 1660. This book, like all the others in Guerber’s history series, is meant for a child’s first introduction to the history of renaissance and reformation Europe. It was written with fourth graders in mind, which is the age we recommend it is read (however, it still remains a child’s first introduction to history, no matter what age history study is begun). Most fourth graders can read this history independently; it also remains very appropriate for a history read-aloud for any children in the elementary grades. Although we encourage everyone to use the Guerber histories, including The Story of the Renaissance and Reformation, with their children in the elementary grades, we have heard from many parents whose teens read these histories with great enthusiasm. Do you have a question about The Story of the Renaissance and Reformation?